Posterior reversible encephalopathy syndrome with spinal cord involvement (PRES-SCI) is a recently described entity with a handful of cases reported in literature. We describe a case of PRES in setting of Henoch-Schönlein purpura (HSP) with involvement of brain stem and spinal cord. Classically, posterior reversible encephalopathy syndrome (PRES) manifests as reversible areas of altered signal in cortex and subcortical regions with predominance in posterior circulation. The syndrome commonly affects hypertensive patients, but may also occur in normotensive individuals in 20-30% cases. , PRES with spinal cord involvement (PRES-SCI) is an extremely rare entity which should be suspected when patients with PRES have neurologic signs clinicoradiologically located to spinal cord with severe hypertension or grade IV hypertensive retinopathy. We describe PRES-SCI involving the cervical spinal cord in a known case of Henoch-Schönlein purpura (HSP) caused by hypertension and uremia. A 22-year-old male presented with a history of frontal headache for last 15 days. The headache worsened since last night followed by a few episodes of vomiting and sudden onset of drowsiness as well as blurred vision. Also, there were three episodes of abnormal involuntary body movements along with urine passage in cloth within last 24 h. There was no history of fever and upper or lower limb weakness. Significant past history included recurrent episodes of abdominal colic, skin rashes, and black tarry stools without any diarrhea or vomiting in every winter season since the age of 7 years. The skin rash was palpable, nontender, nonpruritic and occurred predominantly on lower limbs and buttocks. There was no history of arthralgia or eyelid swelling. Each clinical attack was accompanied with rise in erythrocyte sedimentation rate (ESR), microscopic hematuria, positive stool guaiac test, occasional pus cells in urine, and albuminuria (1 +). Renal biopsy showed features of IgA nephropathy and skin biopsy revealed leukocytoclastic vasculitis. Based on clinical and biopsy findings, diagnosis of HSP was established and steroid (prednisolone 20 mg) based treatment was given on every attack. Last 2.5 years before the current presentation were uneventful without any treatment. On current admission, his blood pressure was 200/140 mmHg and pulse was 100/min. The fundus examination revealed bilateral papilledema with grade 4 hypertensive changes. Deep tendon reflexes and power in all four limbs were normal. The sensory examination was unremarkable with normal flexor plantar response bilaterally. Serum electrolytes were normal. Routine blood analysis showed raised ESR (82 mm/h). Renal function tests were deranged (blood urea 112 mg/dL and serum creatinine 4.7 mg/dL). Urinalysis showed red blood cells (RBCs) 8-10/hpf, pus cell 2-3/hpf, epithelial cells 1-2/hpf, protein (2+), and no cast. Cerebrospinal fluid (CSF) examination was normal. Electroencephalogram (EEG) was normal. Renal ultrasound revealed smaller (right kidney −7.8 cm and left kidney −7.9 cm) and echogenic bilateral kidneys with poor corticomedullary differentiation and slight irregular cortical outline. Color Doppler study and MR angiography (time of flight) of renal arteries were normal. Magnetic resonance imaging (MRI) showed altered signal intensity areas involving bilateral cortical and subcortical parieto-occipital regions, bilateral cerebellar hemispheres, medulla, cervicomedullary junction, and cervical spinal cord until C6 vertebral level [Figure 1] and [Figure 2]. There was no diffusion restriction. Contrast was not administered as patient has renal impairment. A patient was put on antihypertensive and antiepileptic medication with gradual tapering. Blood pressure, clinical symptoms as well as renal function tests improved and completely normalized within next few days. After 25 days, follow-up MRI showed complete resolution of the lesions from brain and cervical spinal cord both. Based on clinical and imaging findings, diagnosis of PRES-SCI was made. Hinchey et al.,  first described a posterior hypertensive encephalopathy syndrome with a predominant posterior distribution of imaging findings on computed tomography (CT) or MRI. PRES typically involves the cortical or subcortical white matter area of parieto-occipital lobes. The atypical patterns include involvement of superior frontal sulcus, temporal lobes (40%), cerebellar white matter (30%), basal ganglia (14%), brain stem (13%), and splenium (10%). Unilateral involvement and intralesional hemorrhage can also be seen. Concurrent spinal cord affliction is exceedingly rare. Based on its several distinguishing clinical and imaging characteristics from classic PRES, De Havenon et al., named the entity as PRES-SCI. Compared to classical PRES, PRES-SCI tends to present earlier, is almost always associated with hypertension of higher grade and involves central cervical spinal cord reversibly with or without cord symptoms. , Patients often present with headache, nausea/vomiting, encephalopathy, visual disturbance, renal failure, and hypertensive retinopathy. Unlike the typical PRES, seizure episodes are less likely reported in PRES-SCI. Few seizure episodes were noted in our case although not documented on EEG. HSP can show unusual neurological manifestation due to renal impairment. MRI brain helps to narrow down the differentials and guiding the management. We thanks Dr. Vikas Khandelia, Assisstant Professor and Nephrologist and Dr. Nirmala Kalwaniya, Radiologist, Government medical college, Kota for their valuable inputs. Choh NA, Jehangir M, Rasheed M, Mira T, Ahmad I, Choh S. Involvement of the cervical cord and medulla in posterior reversible encephalopathy syndrome. Ann Saudi Med 2011;31:90-2.
de Havenon A, Joos Z, Longenecker L, Shah L, Ansari S, Digre K. Posterior reversible encephalopathy syndrome with spinal cord involvement. Neurology 2014;83:2002-6. Hinchey J, Chaves C, Appignani B, Breen J, Pao L, Wang A et al. 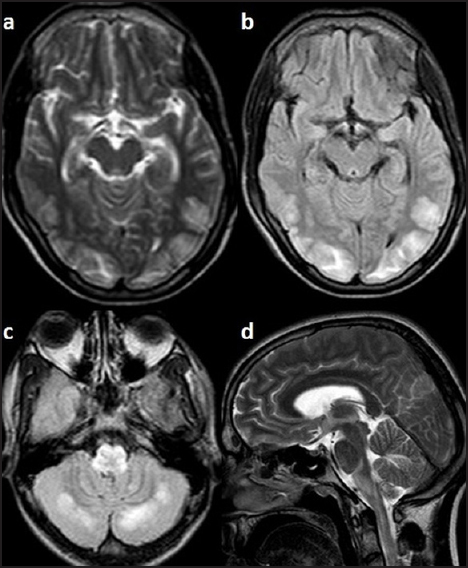 A reversible posterior leukoencephalopathy syndrome. N Engl J Med 1996;334:494-500. Sharma S, Gupta R, Sehgal R, Aggarwal KC. Atypical presentation of posterior reversible encephalopathy: In a child with bilateral grade IV vesicoureteric reflux. J Trop Pediatr 2014;60:331-3. Briganti C, Caulo M, Notturno F, Tartaro A, Uncini A. Asymptomatic spinal cord involvement in posterior reversible encephalopathy syndrome. Neurology 2009;73:1507-8. Kamath N, Rao S. Henoch-Schonlein purpura: An update. Indian J Rheumatol 2012;7:92-8. Garzoni L, Vanoni F, Rizzi M, Simonetti GD, Goeggel Simonetti B, Ramelli GP, et al. Nervous system dysfunction in Henoch-Schönlein syndrome: Systematic review of the literature. Rheumatology (Oxford) 2009;48:1524-9. Berube MD, Blais N, Lanthier S. Neurologic manifestations of Henoch-Schonlein purpura. In: Biller J, Ferro JM, editors. Neurologic Aspects of Systemic Disease Part II Handbook of Clinical Neurology, 3 rd ed, 2014. San Diego: Elsevier B. V.; 2014;120:1101-11. Matiello M, Magana SM, Weinshenker BG. 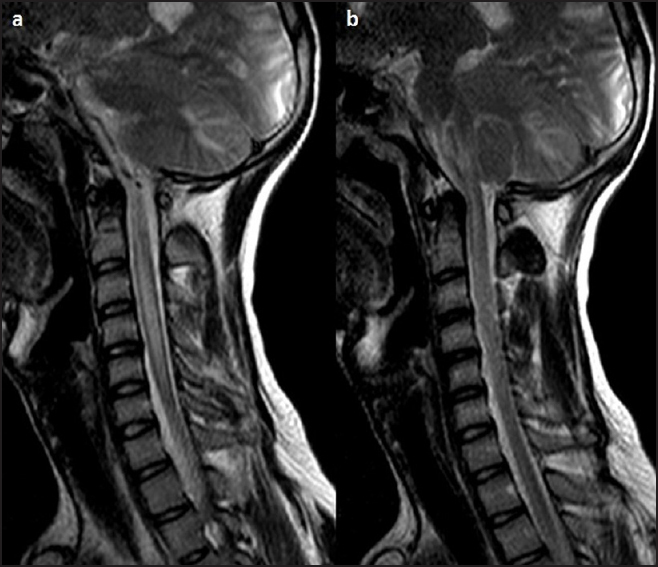 Asymptomatic spinal cord involvement in posterior reversible encephalopathy syndrome. Neurology 2010;74:1478-9.